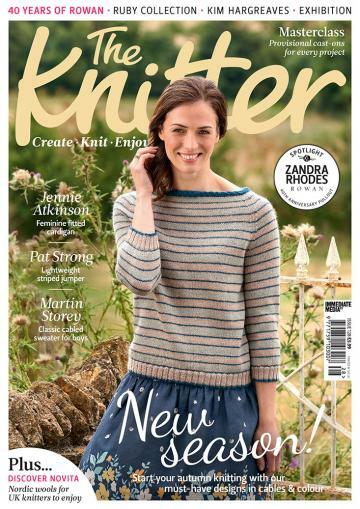 It's the start of autumn, so it's time to plan your new season knitting! To provide inspiration for you, we have projects in colour and cables, including an elegantly textured sweater, a chic colourwork jumper, and a feminine fitted cardigan by Jennie Atkinson. Create special knits for your home with our heirloom blanket design; we also have a handsome cabled sweater for boys, designed by Martin Storey. In this issue, we're celebrating Rowan’s 40th birthday, with a look at the iconic brand's history and its anniversary celebrations, along with an interview with the influential Rowan designer Kim Hargreaves. We also welcome the arrival of Finnish yarn brand Novita to the UK, and meet the inspirational woman behind Rauwerk. Plus, we have a stunning cardigan in Kidsilk Haze by the queen of colour, Zandra Rhodes.